Sandwiched between a parking lot, Cornell Campbell House, a housing complex, and busy Kingston Road, Fred Johnson Park is a small, inconspicuous space that flies under the radar – but take one step into the park, and you’ll form another impression. A garden-lined path leads you to a sitting area sheltered by a large gazebo, while towering trees form a canopy of leaves above your head. After spending some time sitting on the grass, you are sure to realize that the park’s tucked away location is its biggest strength: it’s a little oasis in a big city. Red Dress Productions is a partner tailor made for an event like Arts in the Parks. 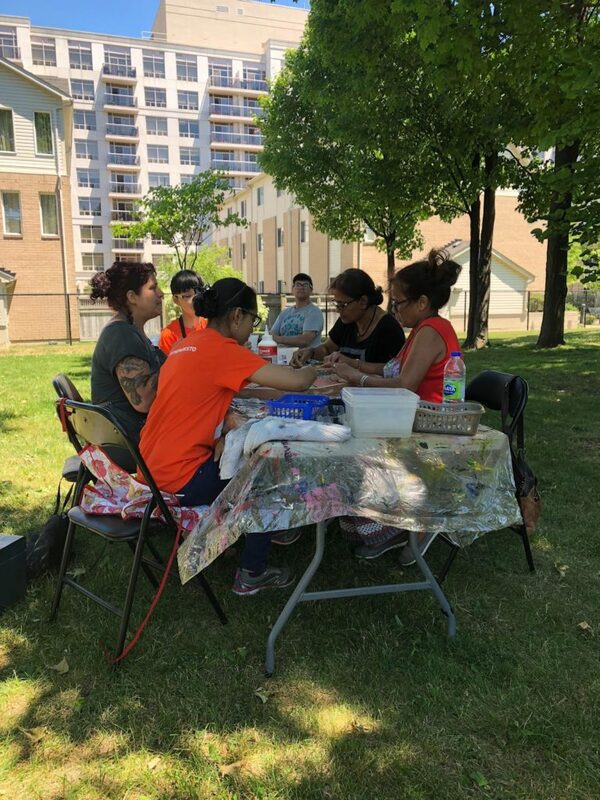 This Toronto based not-for-profit specializes in community-based art/performance projects and seeks to transform public spaces into reflections of their communities. Red Dress is committed to representation and accessibility, meaningful – and necessary – dialogue on what those concepts mean in today’s world. To that end, To The Table is the most recent in a long line of projects created since the company’s inception in 2005 that directly engages communities to work through the issues that affect them most via art. Anna Camilleri (far left) leads participants in a mosaic workshop. I had the opportunity to attend the first To The Table workshop on July 3rd. 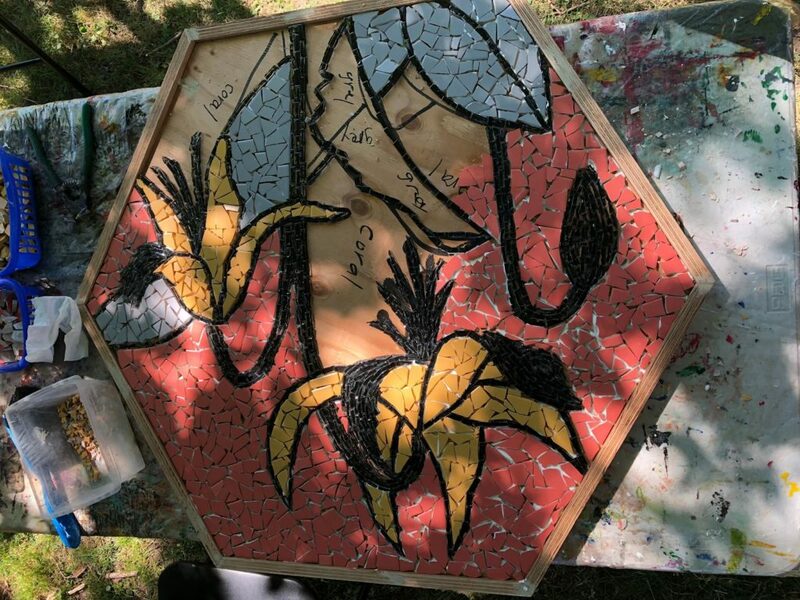 That day’s workshop focused on ceramic mosaic making; myself and other participants filled in a trout lily design with shards of coloured porcelain. The designs were traced on large pieces of wood fitted into hexagonal frames that will eventually form the tabletop portion of the structure. Co-artistic director of Red Dress Productions Anna Camilleri told me that the shape of the frames was inspired by honeycombs. Bees, she said, live in communities that require every one of their members to play an active role in making sure they thrive. The comparison seemed perfect for the message behind To The Table. Mosaic itself presents a useful parallel to the idea of community. You’re faced with a collection of pieces, each of a unique size and shape, which fit together to make a cohesive whole. There were tricky spots that seemed impossible to fill, but with a little bit of work, every piece found its place – and at the end, made an incredible piece of art. I’m looking forward to seeing the rest of the sculpture put together, and eventually taking a seat at Red Dress’ table – no reservation required. Our progress on one of the tabletops. previous post: The rise of outdoor cinema: why do we love it so much?